Water is all the rage. It gets mentioned in every single high profile space mission of late. Searching for water on Mars, water inside Europa, water in the atmospheres of exoplanets. Going to the Moon? Don’t forget to check for water! All with good reason, of course. Being made of 72.8% water, it’s rather important that wherever we might go in the Universe, we have a ready supply of it. But water’s been found in some surprising places. The Sun isn’t the first place you’d expect to find water. At a temperature of around 6000°C, the Sun’s photosphere is the nearest thing you’ll find to an actual “surface” of our parent star. At such an immense temperature, the photosphere is a collection of gas and plasma which form into cells known as granules. With a lifetime of about 10 minutes, these granules bubble up from below the Sun’s photosphere, before bursting like soap bubbles. Collossal soap bubbles. With an average diameter of one thousand kilometres, solar granules are typically about the size of Greenland. 6000°C is too hot for water to exist. At these temperatures the molecules simply split apart into hydrogen and hydroxyl (OH) radicals. But there are some slightly more hospitable spots on the Sun. Cooler spots. Sunspots. Cool is a relative concept when you’re talking about the surface of a star. At around 3500°C, a sunspot still emits a huge amount of light. Out of context, a sunspot would be brighter than an electric arc, and much brigter than a burning magnesium ribbon. Compared to the rest of the Sun, though, they appear dark. With radii comparable to a small planet (the Sunspot pictured here appears to have roughly the same radius as planet Earth), sunspots are the Sun’s natural chemistry labs. A whole host of molecules have been discovered in the spectra of sunspots,* including water. Water starts to form when temperatures get below roughly 4100°C. The trouble is that hot water is surprisingly difficult to get to grips with, as far as the theoretical chemistry of it goes. Its vibrations and rotations are so complex that it’s been used in the past as a theoretical challenge for new calculation techniques to be tested on. Indeed, in its most congested regions, the spectrum of a sunspot contains about 50 spectral lines per wavenumber. If you’re unfamiliar with molecular spectroscopy, suffice to say that that’s a ludicrous amount! In order to properly identify the water on the Sun’s surface, new theory work was actually needed. The molecules in sunspots are so full of energy that they’re halfway towards breaking themselves apart. So full of energy, in fact, that many of the molecules are present at energies that hadn’t even been considered in laboratory studies (even if it were possible to attain such energies in the lab). It’s surprising how little we actually know about hot water. All of this can prove to be quite useful elsewhere in astronomy. Water is seemingly ubiquitous in the Universe. It’s been found widely in interstellar clouds. Old oxygen-rich stars, particularly Mira variables, are full of it. In cool red dwarfs and brown dwarfs, water is expected to be the most abundant molecule after hydrogen. Water molecules have even been detected in over 100 other galaxies. Importantly in the past couple of years, water molecules have been detected in the atmospheres of exoplanets. One of the most studied exoplanets is a hot jupiter known as HD 189733b, which has been found to have water vapour in its atmosphere. 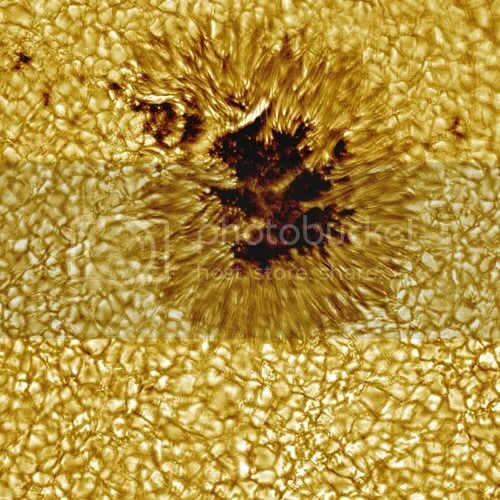 It was found using similar work to that used here, on sunspots. Life on this world seems unlikely. The place is far too hot. All the same though, the detection of water on planets in solar systems outside our own is spurred by the efforts of chemists like those looking at sunspots. Eventually, they give us hope that we might someday find a planet not unlike our own. *Other molecules seen in sunspots include CO, OH, HCl, HF, CN and SiO. It’s rather susprising at first, to realise how much chemistry can go on at the surface of a star. Image credit: Vacuum Tower Telescope, NSO, NOAO. This entry was posted in Imported from Livejournal and tagged astrochemistry, papers, stars, the sun, water. Bookmark the permalink. I always wondered how it could have rained for forty days and night. The Sun could have easily spit that much water at the Earth.